People in B.C. celebrate the court decision quashing approvals for the Trans Mountain expansion. By Derrick O'Keefe. The deal between the government of Canada and Texas-based oil company Kinder Morgan for the purchase of the Trans Mountain pipeline and its planned expansion closes tomorrow, after 99.98 per cent of company shareholders approved it in a vote today. The Trudeau government is paying $4.5 billion for two principal assets: the existing 67-year-old pipeline and the permits for the Trans Mountain expansion project that would nearly triple the pipeline’s capacity. But here’s the thing about that second asset: it doesn’t exist anymore. Today’s court decision to quash approvals for the expansion has effectively halted construction and left the project in limbo. Kinder Morgan’s 2017 annual report pegs the value of all its pipeline holdings at just over a billion dollars. That’s for three pipelines, and in a 2007 report to the National Energy Board, Kinder Morgan reported the value of its Trans Mountain pipeline system at $550 million. At the upper limit, it might be worth $700 million today. It would be a small price to pay to get out from under this toxic asset. The difference between this figure and the purchase price was based largely on work already done on the expansion project ($930 million as of the end of 2017), and on the value of the plans and permits held by Kinder Morgan. As of this morning’s court decision, those permits are null and void. The core asset in this $4.5-billion transaction, the legal right to construct the expansion, is no longer Kinder Morgan’s to sell. And if the pipeline is unable to proceed, the work already done on the expansion is worthless as well. Nevertheless, the government of Canada has announced it intends to proceed with the deal, after which point the entire project is taxpayers’ problem and Kinder Morgan walks away $4.5 billion richer. But here’s the kicker: The purchase agreement with Kinder Morgan includes a “failure to close” clause allowing the government to pull out of the deal, subject to a penalty of up to $10 million. Kinder Morgan could still sue the government, but given the material change to the assets the company is trying to sell, the government might have a strong defence. 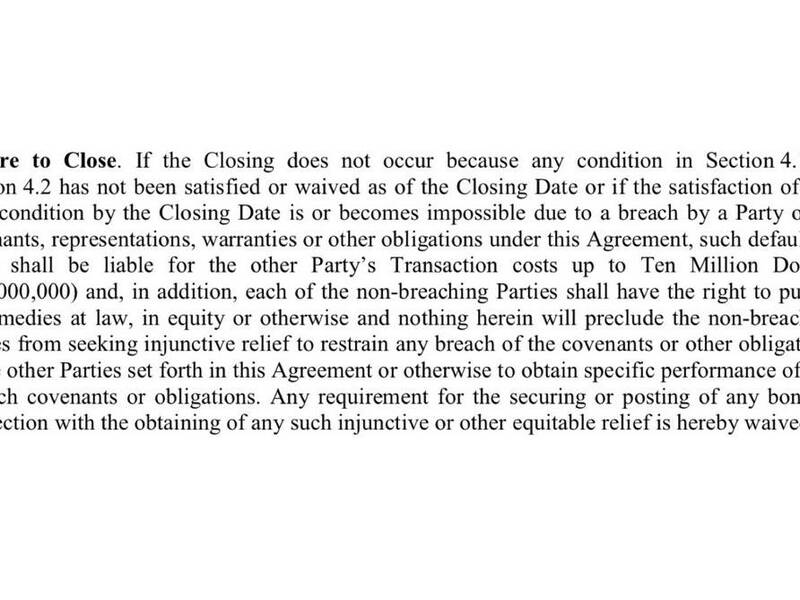 Click to expand and read the full "failure to close" clause. As of tomorrow, we Canadians own it all. And if the project is indeed dead, we’re out $4.5 billion. But as of today, the government could pay Kinder Morgan’s transaction costs up to $10 million and walk away. They might have to defend against a lawsuit; they might not. It would be a small price to pay to get out from under this toxic asset. But they’re not going to do that. As Finance Minister Bill Morneau made clear at a press conference today, Justin Trudeau’s government still believes the pipeline is in the national interest and has no plans to use the “failure to close” clause to cancel the purchase agreement. The question now is whether we’ll allow our government to throw good money after bad. To get it built they’ll need to spend years appealing this decision to the Supreme Court or redoing the National Energy Board review and consultation with First Nations, whom they’re likely to wind up facing in court again at the end of such a process. Meanwhile, the business case for building the pipeline expansion gets worse by the day. But the Trudeau Liberals, to their eternal shame and discredit, would rather throw $4.5 billion of our money down the drain than admit they made a mistake and cancel the deal. By the time you read these words, the deal may already be closed. We’re going to lose the $4.5 billion now, no matter what. The question is, how much more are we going to lose? Construction estimates for the pipeline range from the optimistic Kinder Morgan number of $9.3 billion up to the $15–$20 billion economist Robyn Allen forecasts it will cost the government. But as Kinder Morgan announced today, construction is halted. With approval revoked, no work can proceed. For the government to even get to the point where they can start spending that $9.3–$20 billion on construction, they’ll need to spend millions, probably hundreds of millions, on legal fees, an entirely new NEB review and consultation process with First Nations, or both. Either option leads to delays measured in years, not months. Meanwhile the value and commercial viability of a heavy oil project that transports some of the dirtiest oil in the world becomes more tenuous with each passing year. Throwing good money after bad? The dubious medium- to long-term viability of the project is why Kinder Morgan wanted out and why no other private company wanted in. It’s simply a bad investment. That’s why there’s been such a rush to get it built and make a quick profit, before changing market conditions render such a project impossible. But we bought it. Our tax dollars. Money that could have gone to retraining and support for every oil worker in the country, the people Jason Kenney and Andrew Scheer claim to speak for when they demand we preserve a dying industry rather than invest in transitioning to the energy of the future. Now imagine what $15–$20 billion could do for our schools, our hospitals, our seniors, Indigenous nations that still don’t have clean drinking water and the people in our cities who can’t afford housing. All the promises Trudeau broke? We could have the real-deal version of all of them for less than this boondoggle will cost us. The $4.5 billion is gone. The question now is whether we’ll allow our government to throw good money after bad, and spend another $10–$20 billion to salvage their collective pride. Ricochet produces independent journalism and ideas in the public interest. Support this experiment in crowdfunded news by becoming a member today. * By continuing, you agree to be subscribed to our weekly newsletter.